Baby hand and footprints are one of the most precious keepsakes a mom or dad will ever know whether they have a single child or a dozen. Parents treasure these images and keep them safe in a special memory box or baby scrapbook, at least one hand print and foot print for each child. 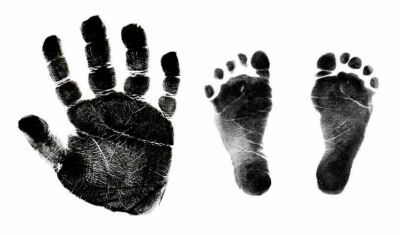 Is there any wonder that projects making use of baby foot prints and hand prints have a special category in the craft community? On this page we have some unique baby hand print footprint crafts ideas in baby blue for boys and pretty pink for baby girls. We recognize that each baby’s prints are completely unique and one-of-a-kind and deserve to be preserved and yes, enjoyed. The craft ideas that you will find on this page offer many ways to put the handprints and footprints on display in fun ways. Chances are that the hospital presented the parents with their first set of baby handprints and footprints along with mommy’s thumb prints. Go here to see what you need. 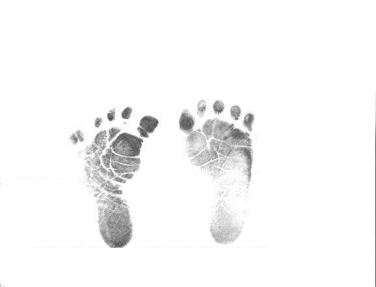 The hospital often sends parents home with their son or daughter's first set of baby handprints and footprints along with Mom's thumb prints. The ink is smudged and the paper is not of the decorative sort but it’s one of the first official records that proclaim whose baby made those precious prints! We keep baby teeth in special porcelain or sterling silver boxes long after the tooth fairy has left the building. A lock of hair from baby’s first hair cut is often treasured in a precious antique locket on a chain around mom’s neck. Shouldn’t we give them the same special treatment as our other baby keepsakes? Certainly! It has been a challenge to find acceptable ways to preserve and display them in the nursery or any location in the home where mom and dad might take a moment to reflect on the time when their child was first born. For one thing, baby hand and footprints aren’t tiny like teeth or flexible like fine locks of baby hair tied with a bit of satin baby ribbon. One creative mom that I know made realistic stencils of her baby hand and footprints and used fabric paint to stencil the baby hand and feet prints in a brightly painted multicolored border on a shirt! She hand painted her baby girls name and date of birth on the cotton shirt and wore it with pride that any new parent can understand! While t-shirts are fun, it’s a real challenge to keep our baby hand and footprints preserved in an unaltered pristine state. We want to keep the records safe so that our great grandchildren can compare their baby prints to ours at some date in the very distant future! The best way to do this is to get a professional baby hand and footprint kit. These baby foot prints and hand prints will be made in a plaster like mix not with ink on paper. Baby foot print ink is messy, but in a different way than baby footprint plaster, so wait till baby is napping peacefully to get a crisp, clean set of 3D baby feet prints pretty enough to frame. While you’re at it, you may as well make several sets since they make excellent, inexpensive gifts to give to the little one's grandparents on special occasions. TIP: A baby hand and footprint stamped on a round or oval plaster disk decorated with a colorful piece of holiday ribbon makes a love ornament for the Christmas tree! Grandparents will adore a tree decorated with lots of little baby feet and hand print ornaments! And that’s just ONE of the craft projects that are easy enough for kids that result in personalized baby gifts that that will make you very proud. These keepsakes will be enjoyed and treasured for many, many years and you made them yourself! There’s nothing quite as sweet as my baby’s hands and feet! Ok, that’s not the best baby handprint and footprint poem, but it is an original and that is a fact. Please visit Unique Baby Gear Ideas again soon to find more projects and new baby handprint arts and crafts ideas shared by our visitors.